Dr. Jack Elias is a well-known pulmonologist in Providence, Rhode Island. He went to Perelman School of Medicine at the University of Pennsylvania to get his medical degree. Dr. Elias did two residencies, both in internal medicine. The first one was at Tufts Medical Center and the second one at University of Pennsylvania Health System. He then did his fellowship at University of Pennsylvania Health System and has been in practice for over 20 years. Dr. Elias is board certified pulmonary disease and internal medicine. 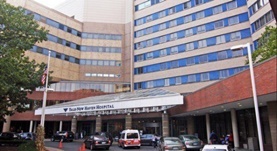 He is currently affiliated with Yale-New Haven Hospital. Dr. Jack A. Elias has contributed to 3 publications. Chitinase 3-like 1 induces survival and proliferation of intestinal epithelial cells during chronic inflammation and colitis-associated cancer by regulating S100A9. Low, D.,Subramaniam, R.,Lin, L.,Aomatsu, T.,Mizoguchi, A.,Ng, A.,DeGruttola, A. K.,Lee, C. G.,Elias, J. A.,Andoh, A.,Mino-Kenudson, M.,Mizoguchi, E.; Oncotarget. 2015 Oct 03. Role of Chitinase 3-Like-1 in Interleukin-18-Induced Pulmonary Type 1, Type 2, and Type 17 Inflammation; Alveolar Destruction; and Airway Fibrosis in the Murine Lung. Kang, M. J.,Yoon, C. M.,Nam, M.,Kim, D. H.,Choi, J. M.,Lee, C. G.,Elias, J. A.; Am. J. Respir. Cell Mol. Biol.. 2015 May 09. Regulation of Retinoic Acid Receptor Beta by Interleukin-15 in the Lung during Cigarette Smoking and Influenza Virus Infection. Wang, J.,Liu, W.,Marion, C.,Singh, R.,Andrews, N.,Lee, C. G.,Elias, J. A.,Dela Cruz, C. S.; Am. J. Respir. Cell Mol. Biol.. 2015 Apr 30.